Port Rowan, June 13, 2016 –Local drivers and visitors to the Long Point area should be extra watchful for turtles and snakes crossing the Long Point Causeway and other Norfolk County roads near wetlands, says Rick Levick, coordinator of the Long Point Causeway Improvement Project. Levick said these animals usually start moving in late April and continue right through into July.. That hasn’t happened this spring which means there could be lots of turtles, snakes and frogs on the roads once the weather warms up. In 2015, only 53 reptiles were found killed on the Causeway, the lowest annual total since the Canadian Wildlife Service did the first reptile road mortality surveys in 1979 and 1980. 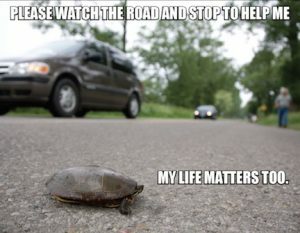 When the project began in 2008, 248 reptiles were found dead on the road. “We’ve clearly made significant progress in reducing reptile road kill on the Causeway because of the 4.5 kilometers of exclusion fencing and nine wildlife culverts we have installed,” said Levick. But he also believes that changes in people’s driving habits and attitudes have made a big difference.